A zebra at Zurich Zoo appeared to be staring into the jaws of death when visitors saw it nose to nose with an open-mouthed hippopotamus. 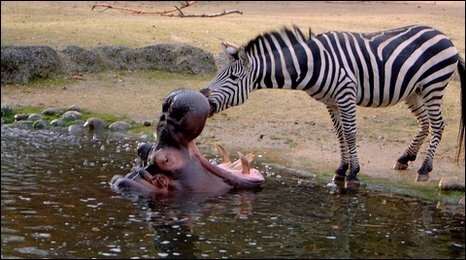 But the hippo had no intention of having the zebra for lunch - it was having its teeth cleaned. She said the teeth-cleaning session lasted 15 minutes and the zebra came to no harm. "The zebra was in the same enclosure as the hippo and its baby," said Ms Sonsteby, 34. "The hippo opened its mouth and let the zebra in there to clean. "Everybody was snapping pictures. It was so great to be there at that moment." The hippopotamus is regarded as one of the most aggressive creatures in the world and has a bite that can cut a small boat in half. Hippos can weigh up to three tonnes and are the third largest land mammal in the world. Although they rarely kill each other, hundreds of fatal attacks on people in Africa have been recorded.